• Y Cartws is a converted cart house. The work was completed at the beginning of 2007. • The approach to the cottage is directly from the road on to a gravelled, private car park. Vehicles may be driven right up to the concrete ramp which leads directly to the kitchen entrance. • The ground floor is level throughout. • All doors, entrances and corridors are wide enough for wheelchairs, walking frames, and pushchairs. The doors are 1840mm wide. • There is conspicuous colour contrast to floors, walls and doorways. • The kitchen, two bedrooms and two bathrooms are all on the ground floor. • One bathroom has a bath, hand-held shower, washbasin, lavatory and heated towel rail; the other is a shower room with a cubicle shower, washbasin, lavatory and heated towel rail. • One bedroom is the master bedroom with a superking bed and wall mounted television with a remote control. The shower room is ensuite to the master bedroom. • The other bedroom is a twin bedded one, with a television and remote control. The bathroom is adjacent to this bedroom. • The kitchen is large with enough space for a wheelchair to go around the dining table. At one end of the kitchen is a large reclining sofa plus a CD player and radio. • The gallery sitting room leads up from the kitchen and is the old hayloft. Access to this is via the stairs only, hence the need for the comfortable seating area down in the kitchen. A stair lift is a possible future solution. • Mobile phone reception is patchy inside the cottage but much better outside. The owner's home is nearby in case of an emergency. • Telephone numbers are displayed in the information corner near the entrance. • Our standard staying period is one week, which runs from Saturday to the following Saturday. Consequently, our change-over day is Saturday. We would appreciate it if guests would try to arrive at or soon after 16:00, and leave on the departure day by 10 a.m. Please call us as far in advance as possible if you're going to be early or late. If you'd like to stay for less than or more than a week, or you'd like to arrive or depart on any other day other than Saturday, then please contact us and we'll be happy to arrange a suitable holiday period for you. • Prices are for one to four people and one cot, staying for one week, which runs from Saturday to Saturday. • One high chair in solid pine is provided, which also folds into a small table and chair for an infant. • This is a non-smoking property and we are sorry but we do not allow pets. • A wheelchair may access all of the rooms via an external concrete ramp. However, the gallery is only accessible by climbing the stairs. Our access statement is displayed on this page if you'd like more information about the accessibility of Y Cartws. • Linen, towels and oil central heating is provided for free. Electricity is included in the price for short breaks. For a week`s booking, the first £10 is included; guests usually consume £10 to £15 a week. As an illustration, the cottage's washing machine can perform a low temperature clothes wash for approximately twenty pence. • For bookings made more than six weeks before the arrival date, a non-refundable payment comprising 35% of the total price is due in order to secure the booking. The remaining 65% of the total price is then due at least six weeks before arrival. • For bookings made within six weeks of the arrival date, guests must pay the full fees for their entire stay in order to secure the booking. • Failure to pay within the periods specified above may result in the owner cancelling your booking and offering the period to another potential guest; this will be done at the owner's sole discretion. Please pay via cheque, which should be made payable to Pauline Roberts-Jones and sent to: Y Cartws, Tynporth, Llanwenog, Llanybydder, Ceredigion, SA40 9UT. You may also pay via direct bank transfer from abroad or within the UK; please contact us after making a booking if you'd like our bank account details. • Some of the advertising agencies we use may have different prices and payment terms listed on their websites or other correspondence. If you notice discrepancies in prices between these agencies and our website then please contact us. If you've found us via an agency then please feel free to make your booking with that agency or through us, directly. • Although the owner understands that accidents may happen, guests are politely reminded that they are liable for any damage they cause to the property, its contents and the surrounding area, arising from negligence or criminal activity. Y Cartws is a five-star, self-catering holiday cottage, converted from an eighteenth century cart house. It is situated in the rural yet accessible county of Ceredigion, West Wales, next to the twelfth century church of the small village, Llanwenog. The cottage is a short drive from the coastline of Cardigan Bay; providing guests with a balance of peace and proximity to popular attractions. We offer free wireless broadband to guests. Mostly built using the original stone, it is well insulated, with a slate roof and oil fired central heating. A private parking area is situated behind the property near the garden and woods. It has two bedrooms, two bathrooms and a gallery sitting room. This tranquil location provides an ideal base from which to explore the surrounding area by bicycle, car or on foot. The property has a lockable outhouse for storage. Our black and white tiled bathroom provides guests with a luxurious setting for a bath. It has been fitted with modern equipment, in an Edwardian style. It contains a handheld shower attachment, loo and heated towel rail. The bathroom is at the centre of the cottage. Consequently, it's well insulated and very warm. The gallery sitting room is situated above the kitchen. The gallery has a solid oak floor. It contains two luxury leather sofas, TV, DVD player and video recorder. An antique chest of drawers sits near the television, it holds videos, books and DVDs. The gallery window provides guests with views of the church, woodland and the valley beyond. It is ideal for surveying the beautiful landscape. Y Cartws has a farmhouse style, limed chestnut fitted kitchen, with slate flooring, ceramic hob, and microwave. The kitchen and the rest of the cottage is kept warm by the oil fired range, situated near the sofa and large windows, it can also be used for cooking. The large windows provide guests with views of the yard and church. At the centre of the kitchen is a large pine dining table, which seats six. The master bedroom is spacious and is open plan up to the roof. It houses a super-king bed. A Victorian style radiator is fitted below the window, which has views of the yard and church. The room has a large wardrobe, TV and wooden floor with rugs. Above the bed hangs an antique, hand-sewn Welsh quilt, purchased locally from Jen Jones. The shower room is ensuite to the master bedroom. It has a heated towel rail, loo and spacious shower. The shower room has a solid, marble floor. The continental style washbasin and vanity unit has its own lighting with movement sensor. The twin bedroom is next to the bathroom and it has two pine beds with wicker bedside tables, and wood flooring. A wicker chest of drawers sits in one corner of the room that acts as a stand for the digital television set. The window overlooks the yard and has a Victorian style radiator beneath it. A large, built-in wardrobe houses a hot water tank on one side to keep clothes warm and aired. The entrance to the property faces the woods, small lawn and car park, and overlooks the surrounding flower bed. The outhouse is a converted pig sty, and it features old stable doors and slate floor. It contains a washing machine, tumble drier, clothes horse, and deep freeze. There is ample room within the outhouse for boots, waders, sports equipment, three dustbins, four sun-loungers and up to four bicycles. The outside barbecue allows guests to enjoy their food from the comfort of a designated area with ample seating near the tranquil church. It benefits from a window to the kitchen where plates, food and drink can be passed directly when needed. The yard outside the property was used as a local marketplace in the 19th century for the produce, livestock and wares of the village and neighbouring towns; it was also an important meeting place. Opposite the yard is a private residence which used to be the 'Tynporth Inn', that served as a local pub for travellers and residents. Local beaches are plentiful and most are under half an hour's drive. 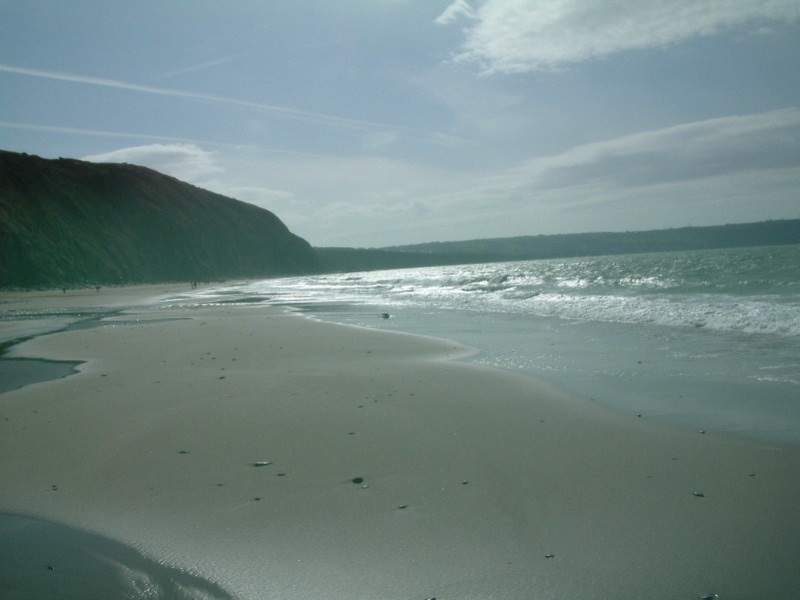 Popular and rural beaches include New Quay (where one can see dolphins and seals), Penbryn, Tresaith (pictured above), Llangrannog, Cardigan, Aberystwyth, Aberporth, Poppit Sands and Aberaeron. There are many rare and beautiful birds to watch locally, including the rare but recovering red kite, buzzards, song birds and owls. Sightings of foxes, badgers and squirrels are not uncommon and guests are bound to see one of the many rabbits running free within the cottage grounds. Ceredigion boasts many nature reserves full of wildlife that are ideal for bird watching. According to Cadw, Wales has 427 castles. There are several sites of historical and cultural importance easily accessible by car within Ceredigion and the surrounding counties, which form parts of mid and south-west Wales. The nearest doctors' surgery is in Llanybydder, a large village just 2 miles away that also hosts the closest bank, pharmacy, garage, and late-night convenience store. A dentist can be found in the university town of Lampeter, which is 5 miles away. It has the nearest supermarkets and other conveniences such as pharmacists and banks. The Welsh National Opera are an award winning and extremely popular opera company who perform regularly in Swansea and Cardiff. You may also hear world famous Welsh male voice choirs locally. Nearby theatres and cinemas include Aberystwyth, Cardigan and Carmarthen, featuring plays, and some of the latest films. The river Teifi is very close to the property and there are many locations ideal for fishing in the area, please view the 'Angler's Welcome' website for more details and the Visit Wales fishing page. The outhouse has plenty of room for waders, angling equipment and a deep freeze for all the fish you catch! Details of restaurants where our guests have had pleasure dining can be found in our information area. Award winning and nationally recognised ice cream is just moments away at Conti's cafe, in Lampeter, and at Hive-on-the-Quay, Aberaeron, respectively. There are many opportunities for cycling along local routes in the beautiful countryside of Ceredigion. Mountain bikers will benefit from being within a few miles of the Llanybydder mountains (Llanllwni and Pencarreg) and Brechfa. The outhouse has room for up to four bikes. There are a few golf courses in the region, with the nearest course, Cilgwyn golf club, situated just a few miles away. For guests who may wish to go horse riding, there are riding centres in Ceredigion. There are also several point-to-point horse races held in the area. There are many surfing sites across the mid-Wales coast. White water rafting, and canoeing are very popular in Ceredigion, especially along the river Teifi, a few miles away. The nearest local swimming pool is in Lampeter; others include: Newcastle Emlyn, Llandysul, Aberystwyth, Cardigan, and Aberaeron. We are sure, regardless of the weather, that there will be some aspect of the coastal and inland countryside that will make a good impression, whether you follow a local walking route or simply ramble around the many natural spectacles of Ceredigion. Guests love walking in Brechfa Forest. Please click here to read our terms and conditions. Copyright © 2006 to 2015 PF Roberts-Jones. Access statement. Y Cartws, Tynporth, Llanwenog, Llanybydder, Ceredigion, SA40 9UT, United Kingdom.